A many of you may know by now, I grew up and lived the first 30 years of my life in Kansas. Much like each region of the United States, there is a fun and quirky story of a local ritual or custom that is misunderstood by many and makes a great story to share. A typical story from America’s heartland is the tale of the black grass. For those who may not know, farmers, ranchers and caretakers of tall grass prairie preserves will intentionally burn the land in the spring time of the year as part of prairie maintenance, leaving the ground in black ash. For those from other regions of the U.S. as well as visitors from other Countries who are not aware of the practice and its sustainable environmental purpose often see the blackened land and have concluded that Kansas can grow black grass. Yes. This is a true story. So, what does a prairie maintenance practice from 1500 miles away have to do with us – here in Windham and Raymond. 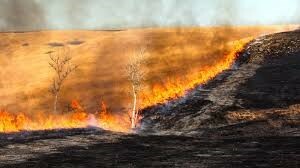 This brings me back to the annual and cyclical practice of prairie burning. According to the National Park Service, tallgrass prairies can accumulate an enormous amount of plants in one year. The leaves die in the fall and the roots go dormant during the cold winter months. The following spring, new shoots grow but as years progress, the leaf litter accumulates and creates a thick thatch covering the ground. New shoots find it harder to take in sunlight and nutrients are locked up in plants yet to decay. The intentional fires burn the thick thatch, and within a few weeks (and not years), fresh green begins to sprout from dark ground. But it is not just one type of grass or flower that comes back, there are varieties that add to the character and beauty of the land. A beauty that has been renewed by fire, a destructive force that transforms. So, as we travel through everyday life and witness moments of chaos, what we might interpret as black grass, may simply be fresh green sprouts we cannot see yet. But once we begin to realize they are there, we will begin to understand the purpose of the dark land - remembering the cycle and know that, as always, it will get better.